I’ve been really busy these past couple of weeks with work. Last weekend the weather was dark and rainy. Today, however, the sky was blue and the sun was shining all day. I took full advantage of the sun’s bounty. I did laundry and hung my clothes out to dry on the clothes line. I baked bread in my SunOven, and I warmed my house with passive solar and a solar air heater. Of course, all of the hot water I use is solar heated. The solar thermal systems are by far the most cost effective. You may not think of a clothes line as a solar powered appliance, but it really is. Reducing your carbon footprint doesn’t have to be expensive, or technically daunting. My solar oven from SunOven.com is a very simple device, and it works great, as long as you can do your cooking while the sun is shining. Food cooked in the SunOven even tastes better, for some inexplicable reason. My motivation for writing this came from a story I heard on the radio. I feel very fortunate in that I have the resources to take advantage of renewable energy. I realize that some people just can’t afford to invest in renewables, even though it would probably save them money in the long term. Actually, the best reason for a person with limited income to reduce their dependence on the grid, is that it saves money and offers some peace of mind, knowing that if the power gets shut off, you’ll still have some basic needs covered. It’s also a lot easier to pay those energy bills when they are a whole lot smaller. From a “save the planet” perspective, people who live modest lifestyles are not the biggest concern. Large office buildings offer a much more significant target for real carbon reductions. People who live in 6000 square foot homes, could obviously convert those into apartment buildings and move into something more practical. However, I doubt any of those people are reading my blog. Based on my experience with energy conservation, there are several things you can do to get started saving some of your hard earned cash without investing anything. You may already be doing some or all of these things, but they are worth mentioning. 1) if you drive, plan and consolidate your trips so you drive less. 2) turn down your thermostat, don’t leave the frig door open, turn off lights, etc., etc. You’ve probably heard most of those tips 99 times. 3) if you don’t use a lot of hot water, you can turn your water heater thermostat down to 120 and save some power. 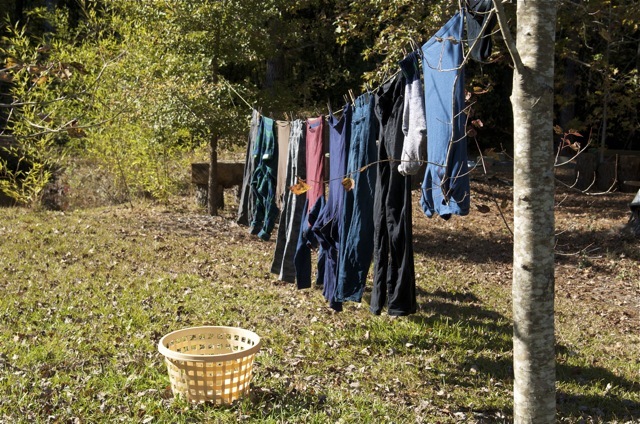 4) use a clothes line instead of the clothes dryer whenever you can. It may be inconvenient, but if you do it often, you’ll save some real money. 5) water can only get so hot before it turns to steam. If you’re cooking something in boiling water, lower the heat to where it will just barely keep boiling. Put a lid on it, if you can. There are some things that call for a rolling boil, but in my experience, most things cook the same whether the water is boiling fast or slow. 6) turn off your TV when nobody is watching it. Actually, you’d be doing yourself a favor if you left it off most of the time. 7) put your computer to sleep and/or turn off the monitor when it’s not in use during the day. Shut it down at night. Those things won’t cost you a dime, but they could save you a bundle. If you can make a modest investment, replacing tungsten bulbs with more efficient bulbs will pay off in a year or two, depending on how much you burn your lights, and the bulbs you buy. I have a couple of 7.5W LED bulbs in my kitchen that were an experimental purchase. I’m sure they’ve saved some energy. My kitchen light is the one that is on from the time it gets dark until I go to bed. It is where I spend most of my time when I’m in the house and I’m not working or sleeping. I wish I could say that the LED lights are performing flawlessly. They are probably about 1 year old and one of them has taken to flickering. An LED can last for 100,000 hours of use, but they run on low voltage DC current, so an LED version of an AC bulb (one you’d screw into a standard socket in your home) requires some electronics to convert the AC high voltage power into low voltage DC current. Apparently my bulb is defective, or it was cheaply made. I may bust it open and see if I can repair it. However, the 12V LEDs I’ve been experimenting with will likely replace my ceiling lights. I will have to run wires around the house to connect them to the battery bank that is charged by my solar panels, but once I do that, I’ll have bright, cheery, low voltage lighting that is also highly efficient and will be there for me, even in a power outage. You might think I’m rich, but I’m not. I live on a very modest income that is well under half the national average. I use the money I save on my energy bills to buy parts, I salvage and fabricate whatever I can, and I do all of the work myself. I do spend money on my solar projects. Of that, there can be no doubt. My recent battery purchase was $400, and I’m afraid those batteries may not pay for themselves before they need to be replaced. The fastest payback with solar electric systems is to use a grid-tie system where you don’t store anything. You use the energy you generate while you’re generating it. If you generate more than you can use, your electric meter runs backwards, and when the sun goes down, you rely on the grid for your power needs. The problem with that system is that, when the grid goes down, so does your solar production. You have all that potential, but you cannot use it when you need it most. I’m more of a boyscout than I am a shrewd business person. I want my solar power to provide me with some security against outages. My solar panels charge a bank of batteries and power some nominal loads during the day. At night, I run some lights and computer equipment off the batteries. You lose 20-30 percent of your power when charging batteries, and when the batteries are fully charged, the potential of my solar panels is often underutilized. The advantage is that my system is completely independent of the grid. It’s like a giant uninterruptable power supply (UPS). Since I have admitted that I’m not the shrewdest business person, I might as well mention that I have taken no tax credits on my investments. I don’t need the government to subsidize my choices. There are some pretty lucrative tax credits to be had, and I don’t blame anyone for taking advantage of them. That is just not my way. Hurricane Sandy may have been the storm of the century, but there are going to be more like it in the next 5 years. Of that, I am pretty sure. People should be talking to their neighbors about how they’re going to weather the next big storm. A distributed power generation system is much more reliable than a centralized one that relies on miles of wires to deliver power. At least me and my neighbors will have a place to charge their cell phones. It’s too bad all the cell towers will probably go down.